Zaru Such a fun sound, I love it!! The lyrical contrast is pretty great too Favorite track: In Space, No One Can Hear You Cry. Jason Darklyte For weirdly wonderful electronic noises and alternative voices singing oddly thought-provoking lyrics, there's no better man or collection to turn to. Favorite track: In Motion. 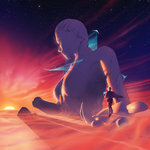 Weston Ellis I've been a massive fan of the synthwave scene for a long time and Color Theory brings something unique to the table with this album. He uses sounds and rhythms that are not normally associated with the synthwave genre to great effect. Color Theory still retains that youth and nostalgia that makes the lighter side of synthwave so pleasant. Side Note: "The Past Yet to Come" is one of the most beautifully composed songs in years. Favorite track: The Past Yet to Come. It’s a running joke in classical music circles that composers die after completing their ninth symphony. If the album is the pop music equivalent, Brian Hazard of Color Theory beat the odds. But if a recording artist is going to put out a milestone tenth album, it had better be good. Though the last two years were prolific, with a dozen single releases, a set of singles does not an album make. “Every great album is, in some sense, a concept album,” Hazard explains. “It tells a cohesive story with a beginning, middle, and end.” So he went back to the drawing board to rethink, rewrite, and rerecord, adding depth and dimension to the songs to create a definitive narrative. The result is The Majesty of Our Broken Past, a melancholy synthwave collection that captures the 80s he grew up in: wonderful, even magical at times, yet wistfully desolate. Special thanks to patrons Leigh-Anne Fraser, Amy BuGoudi, Neil Barnes, spartan300diaz, John Mondick, Marushka, Page One Project, Joel Ollila, and Jonas Ahrentorp. Wait what did you say? You want to come with me? What do we cling to at the last? These are the glory days. But could I be a passenger? I promise to accept you. If you tear off its wings? Does that mean it may come true? To tap my fingers and sing along. Are you prepared to pay the price? In the comfort of your mind? But I can’t deny myself.